Roberto Carlos Gonzalez, 24, gets career advice from Vinnie Sanchez, an SCE lineman. 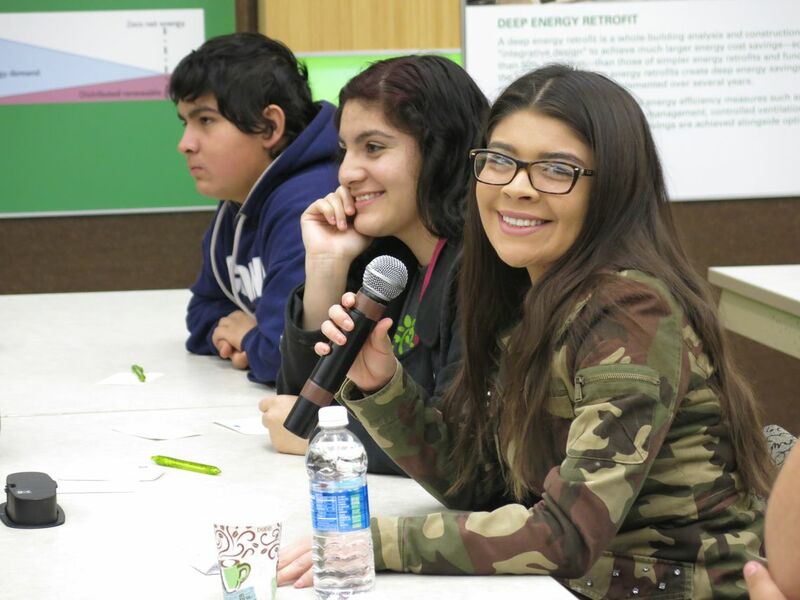 John Muir students toured SCE's Energy Education Center and the lineman trucks in Irwindale. Oscar Duenas, SCE meter teschnician, explains how to read a meter. John Muir students get a glimpse into a lineman's bucket truck. John Muir students try on a lineman's tool belt. A John Muir student takes a selfie with a lineman mannequin dressed in safety gear. At-risk youth, young adults from the Inland Empire learn about careers at SCE. Roberto Carlos Gonzalez, 24, dreams of being a lineman someday. “Sometimes when I get out of work really late, I see the linemen working in the middle of the night up on the utility poles,” he said in admiration. Gonzales works late-night shifts at a distribution center to support his wife and two kids. 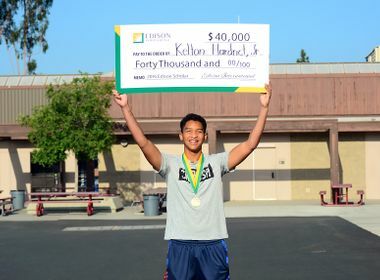 He’s also a high school student at John Muir Charter Schools, an organization with 50 sites across the state that provides high school education to at-risk youth and young adults between the ages of 16-25. 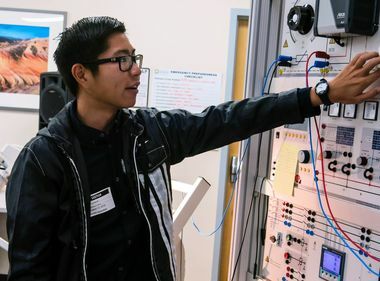 Despite only getting a few hours of sleep the night before, he rushed to join his school field trip to Southern California Edison’s Energy Education Center in Irwindale, where he was able to engage with SCE employees about pursuing a career as a lineman. SCE hosted in December 60 students from John Muir Charter Schools’ Inland Southern region, including Rancho Cucamonga, Riverside, San Bernardino and Indio as part of their Career Pathways Program that prepares students to achieve lifelong sustainable employment. The event included an interactive panel discussion with SCE executives and employees about careers and the future of the utility industry. There was also a tour of the facilities and lineman trucks. Mariah Bencomo, 17, aspiring police officer, asks the panel a question. For Bencomo, it was also comforting hearing about opportunities available to her. 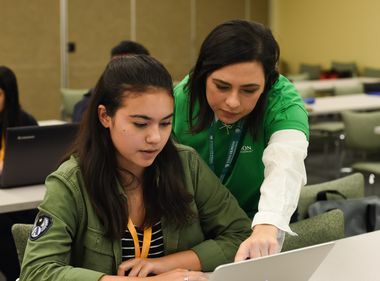 “Unlike a lot of cultures in the world, the United States of America is a place where you can start, you can fail, you can start over again, fail and start over again,” said Gaddi Vasquez, senior vice president of Government Affairs for Edison International and SCE. Some of the students had never heard of SCE. Gonzalez will graduate from high school in January and plans to study to become a lineman. To learn about careers at Edison, visit: edisonjobs.com.